When my girls were tiny, nothing delighted me more than hauling out the sewing machine (well, OK, I never really put it away as I should have) and creating an adorable little outfit out of a yard of fabric, some lace and maybe some snaps or a button or two. Halloween was paradise for me. I could create the most outlandish outfits and have the kids thrilled to wear them. (They were much more appreciative than Shaun ever was!) One of my girlfriends even had me make costumes for her sons as well. She would take all the kids for a few hours while I would sew. I think that we were both convinced that we each had the better part of the deal. So we went to the fabric store and looked at patterns and fabric. (I learned to my dismay that my child thinks glittery, sparkly stuff is tacky. How can that be??? ) It was a tough decision…nothing seemed just right. Somehow, we went from making a formal to making a Spring Dress. We purchased everything we needed and placed it on the table when we got home. I promptly forgot about it…for a day…until KT started to jabber on how she really didn’t want to become a nag of any sort. She really, really wanted to wear the dress on the first full day of spring. Being the indulgent mother that I am, I told her that I would start working on it last night, but that it most likely wouldn’t be done in time for her to wear to school. She sadly went to bed and I got busy. Around one in the morning, I tried it on her my sleeping child. To my horror it didn’t quite fit! I had to get inventive to make it work. This morning, I tried it on her again and found that my adjustments had made it too big. Thankfully, I hadn’t put the zipper in yet so I could still make it work. It’s not the best work I’ve ever done. I didn’t really have a way to properly fit it, but my little girl was thrilled to be able to wear her brand new dress to school today. It may take a little more than a yard of fabric and a bit more work to make an outfit my little girl is delighted to be wearing. But I still think it is worth it. After all, as Shaun keeps reminding me, I won’t have them with me forever…. This entry was posted in It's all about me!, KT. Bookmark the permalink. Ah, so you are a seamstress! And a good one at that! Stitches of love are surely worth the effort, aren’t they? My mom sewed for me, and I for my children. One of these days I hope to have some grandbabies to sew for. My favorite Christmas memories are of pulling brand new flannel nightgowns out of the wrapping paper each year. You are making clothing and good memories all at the same time. You’re so talented…The only thing I ever made was a dress in Home Economics when I was in highschool. It turned out okay but I only wore it once. 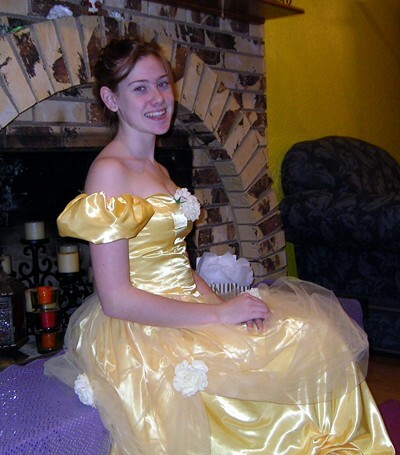 I loe the “Belle” dress….it is the dress from Beauty and The Beast, right? I think it’s beautiful! WOW! That’s pretty awesome that you stayed up so late to finish it. You’re a pretty cool mom. Susan, you’re quite the Mom… Your daughters are so fortunate. I always disliked sewing but ended up sewing costumes and Christmas presents all the time. Now I’m kind of proud that I actually did it. SIGH. Over the years you just learn to live with the skills you do not have and eventually new skills take over. She, and the dress, are lovely. In the first pic she looks like Belle from Beauty and The Beast. I love the color of the dress in the second. You are so talented! I barely know how to sew buttons. What an awesome mom you are. I bet you got your sewing abilities from your brother who in his day made some dress slacks for himself (that he never wore and that looked ugly) and three letters for his favorite sister “SOU” Ok maybe you did not get your abilities from him. That’s wonderful and so pretty. Except for the quilt tops, I don’t do a whole lot of sewing, and certainly nothing that I could wear! You’re so talented. I made a skateboard pillow in Home Ec, but I put two left feet on it. So telling. You MADE that? I can’t even make toast. Impressive, even if it’s not your best. What’s most impressive are your willingness and effort. I still remember that my mom made my Prom dress my senior year of high school; it was one of the few I ever wore that actually suited me. Oh WOW! I so wish I could sew! It amazes me that you actually MADE those two dresses in the pictures! Like with your own little hands and everything! You are truly an AWESOME mom! I think that it looks great. I have been out of the loop for a while. You might come for a visit at my resurrected blog,Return of the White Robin. as I try to enter the blogging world again. I can only sew a straight line, so I am limited to duvet covers, pillows and window coverings. I am in awe of anyone who can make clothing. I have photos of my mother, my sister and I in matching dresses my mother made. They are adorable. I just never could get the hang of it all. Yet my sewing machine sits on the floor in my den, and I haul it out to fix a hem or sew a pillow. Not nearly as amazing, but satisfying in its own way. You are amazing!!! I’ve never sewn with a sewing machine, but I’ve always wanted to try! She looks like Belle (Disney) in her formal dress 🙂 Gorgeous! Did you made both dresses? You are so lucky you can sew so well. I sew, but it’s painstaking work for me. I stopped making clothes a long time ago. I make all my window treatments. I don’t enjoy it! Most seamstresses wouldn’t have a clue how to sew with safety pins, glue gusns and the like…I guess I’m just more immaginative than most! You know, it may have only been very basic repair methods, but I have always been greatful that my mom taught me to sew as a kid (and as a man I am not ashamed to admit that). Just imagine what you could teach your kids. My baby brother took home ec in high school. He’s pretty handy with the sewing machine…well at least he used to be!